Putting it here so that hopefully people curious about why one bad disposition is so negatively affecting their pally defenses. In all cases, only a disposition score up to 3 is counted. 4 is counted the same as 3. 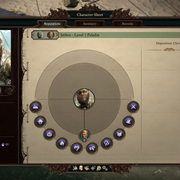 It's been mentioned in this forum before, but I still see people getting confused about it, but for hired adventurers, they use YOUR current dispositions. This is different from POE1 (where companion paladins scaled by level instead and companion priests not at all). This means that e.g. a priest of skaen recruit is not going to play well with you if you rolled a kind wayfarer main character (which is a perfect overlap between favored dispositions for the paladin and disfavored reputations for the priest). Dispositions are the same as in PoE1 (you can look up on wiki). I don't know what Pallegina's special subclass paladin's dispositions are, the fact that I was testing on a character with crazy reputations and Pallegina still had +8.9 neutral faith and conviction almost makes me think she has none. Holy Radiance heals a base of 15 health. It starts with a base +5 disposition bonus. (So with neutral disposition you will heal 20 health). Each positive disposition gives you a +20%/rank modifier to the disposition bonus. Each negative disposition gives you a -20%/rank modifier to the disposition bonus. So if you are a priest of Wael and have 3 Clever and 3 Shady, you'll get +120% bonus, for a total of +11 disposition bonus. Importantly, like every other penalty in Deadfire, penalties go through an inversion and are treated as a "rate" multiplier, so each individual disfavored disposition will actually outweigh an equivalent-strength favored disposition. Holy Radiance is also at PL0 so it has an inherent +10% priest PL scaling to heal effect. Importantly, this and any power level scaling only applies to the base healing of 15 health; the disposition bonus is excluded. But after you apply disposition bonus and power level scaling, you get a subtotal any other modifiers (might, bonus to healing, etc.) are applied this larger subtotal. The same thing applies Holy Radiance's burn damage, except it has a base 12 burn damage, and a +5 base disposition bonus. Again, power level scaling only applies to the base burn damage, but all other modifiers apply to the subtotal you get after applying the disposition bonus and power level scaling. Again, ranks in disfavored dispositions outweigh equivalent-magnitude. The upshot is that the healing scaling is kind of meh; the difference between a blasphemous priest and a devout priest is about 10 points of healing before might and other modifiers. This is not nothing, but is a huge step down from the massive scaling you could get in poe1. On the other hand, scaling for burn damage is still significant, because even though it's still the same +5 base disposition bonus, the damage repeats every few seconds, so the difference between a neutral priest and a devout priest can be a decent chunk of change. If it were up to me, I'd fix it so that the disposition bonus also scales with power level. Keep the above in mind, because these numbers have almost nothing to do with how faith & conviction and deep faith actually work and makes me suspect that either whomever wrote these lines had massive typos (likely for the faith & conviction stuff) or even Obsidian doesn't completely understand the ramifications of their double-inversion system (very likely). Basically Paladin defense bonuses work a lot like the priest Holy Radiance stuff, except for Faith & Conviction you have a "base" +8 to all defenses, and then a +.9 neutral defense bonus (you still get 20% modifiers based on your favored/disfavored reputations). Once again, disfavored dispositions outweigh equivalent-magnitude favored dispositions. Note that a ramification of this is that the range for Faith & Conviction is actually 8.2 to 10 (with in-game rounding). I have no idea how any designer at Obsidian who understood their own system thought that you could actually get down to a +6 defense, the penalties just don't work this way. (Confirmed studiously in-game). For Deep Faith, it's similar, except a +10 base to all defenses and a +2.25 neutral defense bonus (with 20% pos/negative modifiers). Once again, I have no idea how Obsidian thinks the range for this is 5-15, because the actual range is 10.6 to 15. (Confirmed studiously in-game). Note that due to the way Faith & Conviction works, disposition barely matters for a normal paladin. The difference between a blasphemous paladin and a devout paladin is 2 defense essentially, and the difference between a blasphemous paladin and a neutral paladin is virtually nothing (it is theoretically .7 defense, but very few effects in the game especially post 1.2 have fractional defense or accuracy so in practice there's hardly ever a difference between 8.2 and 8.9). For Deep Faith it'll matter a bit more, as +5 all defenses can be a significant difference. This is again unfortunately a far cry from poe1. Spiritual weapons use the same equation as other scaling, except it's a base +20% lash, with a +5% neutral disposition bonus, and then the 20% modifier (positive or negative) based on disposition rank. The effect of this is that the range of the spiritual weapon lash is not [20%, 30%] as the patch notes say, instead the range is actually [21.25%, 31%] (it's hard to completely verify this in game because it depends on relying on the combat log which does rounding, but for all intents and purposes I have verified this range in-game via repeated attacks on Aloth). Like the other disposition scaling stuff, negative dispositions outweigh positive dispositions. On the plus side, this range is actually slightly better than promised, a 31% versus a 30% lash is not huge, but it's also not nothing. Now that I've confirmed how Spiritual Weapon's faith attuned lash works, I strongly suspect what's happening here is that there's some scripting function that gets called with two arguments, a base and the neutral modifier. Someone on staff explained it one way while (possibly mistakenly) implementing it another, and now everyone who uses this script call is copy-pasting the same mistaken understanding of the range the script function produces, because I suspect in every place it is used, designers thought it was going to give them a linear range of [15, 25] (healing for Holy Radiance), [12, 22] (damage for Holy Radiance), [6, 10] (faith and conviction), [5, 15] (deep faith), and [20, 30] (spiritual attunement) instead of the non-linear range of [15.8, 21]; [12.8, 23]; [8.2, 10]; [10.6, 15]; and [21.25, 31] respectively. On the plus side, if Obsidian feels like fixing this, it should just involve changing one script function and everything else will get updated. Edited by thelee, 15 July 2018 - 09:56 AM. Fascinating, thanks for doing the research. This was one of those simple things that I understood the concept behind, but never had any idea what the actual math worked out to be so this is really cool. Part of me wants there to be more consequence to dispositions for Priests. Spiritual Weapon is just one optional ability among many. Holy Radiance is OK, but it's easy to lose sight of it in the myriad of new spells that Deadfire Priests gain as they level-up. 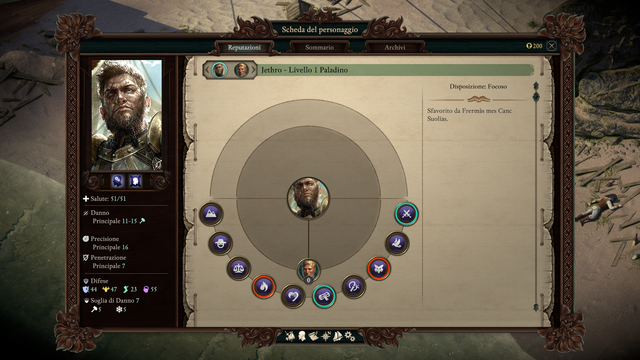 In Pillars 1, it had the distinction of being per-encounter, separate from the per-rest spell pools, which gave players an incentive to keep using it into the late game. Now, it has a bigger AoE than Restore, and doesn't count as a 1L cast, but, for most combats, it's reasonably equivalent. I'd like to see them bring back abilities analogous to Pillars 1's Inspiring and Aggrandizing Radiance, to give Priests some more interesting build options (e.g., are you more about buffing your party, or yourself? ), to make the ability more like other class-defining abilities, like Spiritshift and Carnage. On the other hand, some of the arbitrary-feeling disposition attribution in the game's dialogues makes me happy that a Priest can safely disregard the disposition effects of his/her choices. Edited by Enoch, 10 July 2018 - 07:11 PM. I agree, and I'm torn about the state of disposition in this game. It generally feels less consequential, both from a RP perspective and for the reasons you gave. I liked how much of in-game incentive priests/paladins in poe1 gave to role-playing properly whereas here it really seems more of an afterthought for the average gameplay experience. Maybe they should bring back Unbroken Faith and then increase the influence of disposition. I think this is near certain. Obsidian showed in the past that designers don't understand the programmer's math or simply how some mechanics worked. - PoE: Josh didn't understand (during a stream) that a bashing shield usually resulted in less dps than having a normal shield (when using auto-attacks) because you get no speed bonus (no dual wield info bonus) but alternate your normal weapon damage with very low bash damage. - PoE: Designers put lowish elemental lashes (10%) on several abilities/items without knowing that lashes don't get added but rolled against DR seperately and don't profit from DR bypass and have no MIN dmg - the result was that lashes under 15% usually didn't make it through DR at all. - Deadfire: Blunt Criticals had a -25% crit damage malus. Crits in Deadfire do +25% bonus damage. Somebody at OBS thought that would result in +-0% crit damage while it really leads to a situation where crits do less damage than hits. - Deadfire: giving weapons that do raw damage a lot less base damage (most of the time only half the base dmg). This would make sense in PoE where armor had DR reduction - but it makes not much sense in Deadfire where you have no DR. With raw dmg you can't underpenetrate, but you also can't overpenetrate - not even when critting. 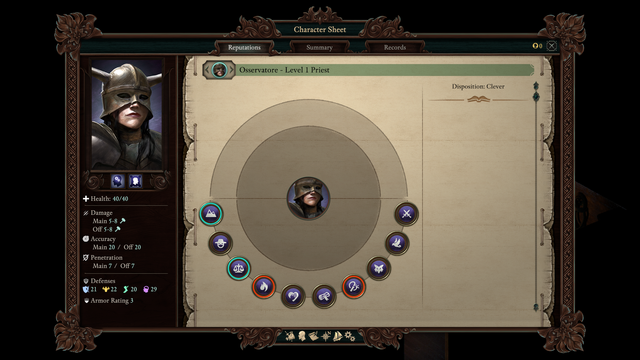 - Deadfire: the Gunhawk has a 80% chance to interrupt with a shot from an arquebus or pistol but 20% per blunderbuss pellet. Blunderbusses shoot 4 pellets, so 4 * 20% chance per pellet is a 80% chance like with the other guns, right? Eh no, it's ~60%. One pellet needs a 33% interrupt chance in order to land near 80% after 4 attack rolls. This shows (in my opinion) that the guys who balance the game or make "mechanics" decisions don't always fully understand how the underlying systems actually work. They see that something is too powerful or too weak - and then, when trying to determine what might be a better value, are wide off the mark because they assume how some mechanics work without really knowing. Edited by Boeroer, 11 July 2018 - 02:43 AM. Any idea about which ones should fit better for this order? Edited by kilay, 11 July 2018 - 02:16 AM. - PoE: Josh didn't understand (during a stream) that a bashing shield usually resulted in less dps than having a normal shield. Just off the top of my head, I'd say Positive: Aggressive, Diplomatic, and Negative: Passionate, Clever. The Frermas strike me as equal parts negotiators and enforcers, and they seem very rules-oriented. I think that's likely, yes. I thought he same but anyway why Pallegina should be better than a paladin hireling? Edited by kilay, 11 July 2018 - 08:44 AM. Edited by kilay, 13 July 2018 - 12:55 AM. That information doesn't give me hope that game will be properly balanced. After all if you don't understand underlying mechanics, how you can properly adjust it? What about Xoti and Eothas, then? Also, looking at Pallegina in my game . . . . "Faith and Conviction" base gives her a +8 deflection, but on her character sheet, it's actually giving her +8.9 deflection. What's the extra .9 deflection coming from, if not reputations/dispositions? Edited by Dr. Hieronymous Alloy, 15 July 2018 - 11:26 AM. Aggressive and diplomatic are complete opposites ^_^ . By the way, as far as I know Priest and Pal companions have no disposition, their disposition-based abilities improve with level ups. Edited by thelee, 15 July 2018 - 09:53 AM. I updated my OP with my findings from spiritual weapon (they actually have a lash range of 21.25 to 31, not 20 to 30) and added a POSTSCRIPT 2 where I strongly suspect there's a single script function that is either implemented incorrectly or explained incorrectly so designers are implementing these disposition scaling thinking it does one thing when it really does another. Edited by thelee, 15 July 2018 - 09:51 AM. The Frermàs mes Canc Suolias (Brotherhood of the Five Suns) is a paladin order of the Vailian Republics. The "Five Suns" refer to the five Vailian ducs bels, ruling over the five most powerful republics: Spirento, Ancenze, Selona, Ozia, and Revua. The Brotherhood is loyal to the collective will and resolutions of the songretta ducala (ducal congress), rather than to any particular duc, thanks to traditional laws barring the brotherhood from taking sides in ducal debates. To further accentuate their independence, all prospective brothers train together in an isolated fortress under the Ozian Bastions. One of the most important lessons imparted to trainees is that physical strength and violence should be kept in reserve, once all other options are exhausted. Wits and words are the preferred tool to navigate and mediate conflicts. Edited by kilay, 16 July 2018 - 02:44 AM.